Working from the heart is the core of Marie Kondo’s “The Life Changing Magic of Tidying Up”. This little book has had a big impact on my work with clients and I love to share these tidying up tips. It’s great to have shared reference points as we work together to make a difference downsizing in homes and offices here in the San Francisco East Bay. The book’s petite size can be deceiving because it’s packed with details. What holds it together for me are some gems that I use working with clients in their homes and offices, creating a new experience with their supplies. “Supplies” sounds rather cold. Marie Kondo has a very warm relationship with the things she chooses to keep around her. She thanks her clothes for their service and makes sure they’re stored in a way that honors them, so they can breathe and relax and come out of the drawer ready for adventure! My take on the STUFF of our lives: it’s all supplies that support our activities. Even memorabilia, if it is going to serve as such, it needs an active role, to be handled or displayed. Otherwise it sits in a box either well-hidden or in the way. Have you invested time organizing just to watch it fall apart? 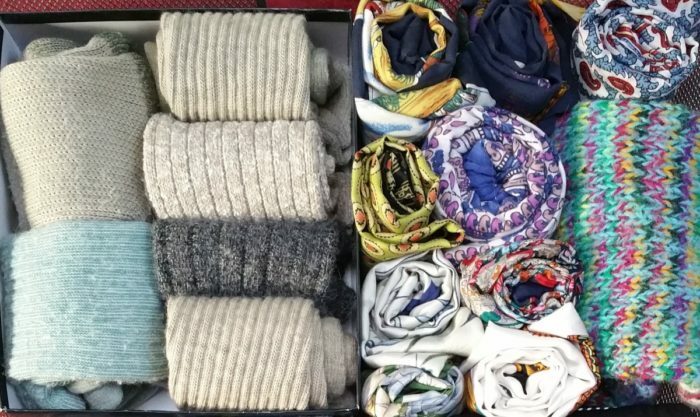 The KonMari method promises to be so thorough you’ll never have to do top-to-bottom tidying again. It’s kind of like the Cutco knives ad, there are so many benefits! You not only get your affairs in order, you get a new way of considering your priorities, clarity about the value of your possessions and a clearer sense of what you want to do with your life. The foundation of her method is working from the heart. Focus is not on what to part with but what to keep. Hold each item and ask “does this spark joy”? Don’t knock it till you’ve tried it. Storage should reduce the effort it takes to put things away, not to get them out. This has become my golden rule! Tidying by location is a fatal mistake. Always think in terms of category not place. Don’t scatter, store all items of the same type in the same space. 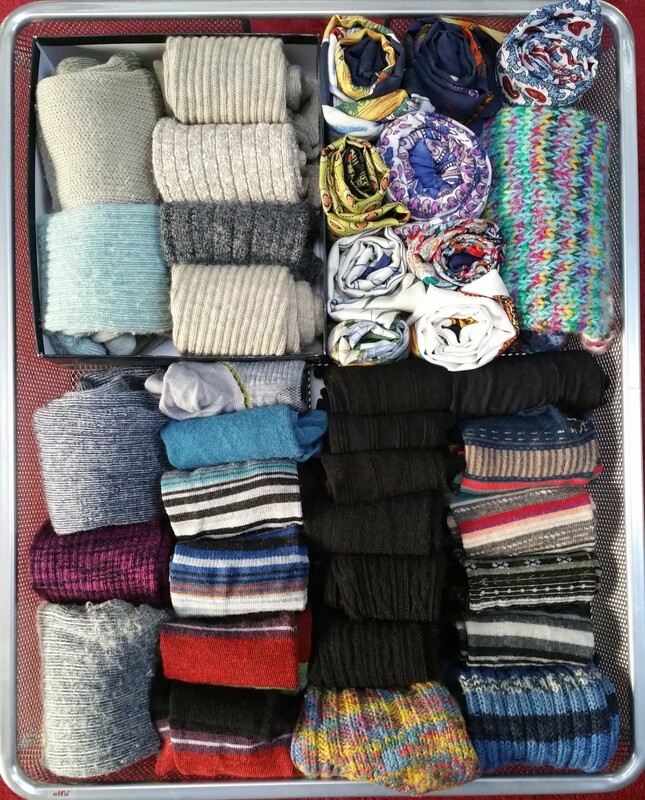 Tidy in the right order. Sequence: clothes, books, papers, komono (miscellany) and momentos. Clothes are easiest because their rarity is low. Last in order would be the hardest things to replace in the event of a disaster like a fire. Make decisions about what to keep not what to discard. Focusing on what to throw away could only bring her unhappiness. Does it spark joy? “When you start focusing on how to choose, you are already veering off course.” Put everything in the chosen category on the floor in a pile and pick one thing up. Does it spark joy? Keep only the joy pile and put them away neatly. When letting things go, thank them for their service. It may seem awkward at first, but it gets easier! If a category is too large, like all shirts, start with one type like long sleeve. You cannot discard for others. Do your best with your own space and it will influence others. Does clutter just not bother you much? Wonder if you should feel guilty about it since everyone is talking about it? Absolutely not! We know people with busy, incredibly productive lives who could not function in a tidy environment. If you are bothered by clutter, Marie Kondo suggests, “Reduce till you reach the point where something clicks, you might hear yourself saying “this is enough, I feel free, I feel motivated””. If you are so motivated, allow me help you try this method. Most important, don’t let the clutter get between you and the things you love to do! If you want to get this process started, and need a tidying partner or coach, contact us for a free consultation. We can work side-by-side or remotely via zoom. Or visit https://www.napo.net to find an organizer near you. Thank you for reading our blog.